I have no reason to believe that I will die soon, and yet, I realize that I must begin to prepare for my demise since it would not be impossible for me to die tomorrow. My children are all grown and so it is also possible that I might someday like to move out of my big house into a smaller home. I am slowly beginning to go through my things with a view to reducing my belongings in anticipation of either death or moving. While I have contemplated this task for a while and read several books on how to approach it, I have not really been terribly successful at reducing my worldly goods. A blog I wrote one year ago at Christmas considered this just in terms of my desk and not much has changed since then. 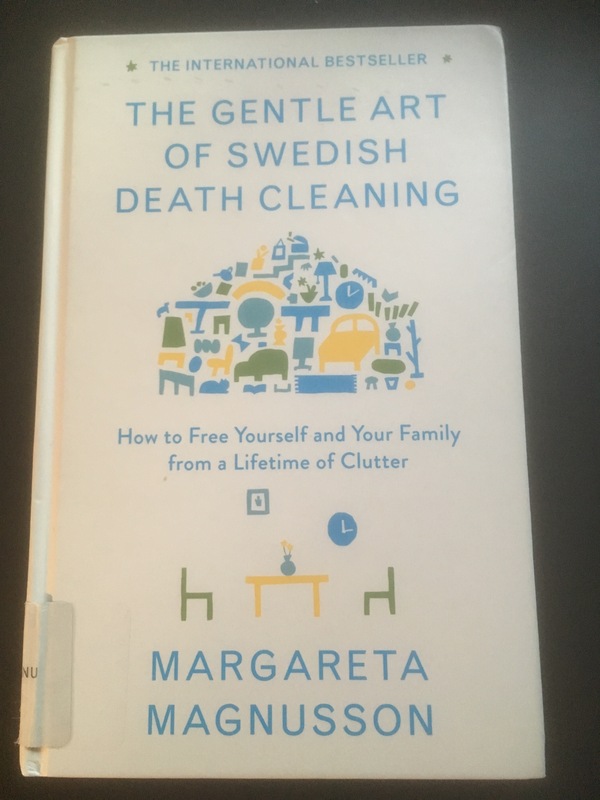 I read Margareta Magnusson’s The Gentle Art of Swedish Death Cleaning: How to Free Yourself and Your Family from a Lifetime of Clutter. Since then, I have an approach to my belongings that signals that I will have greater success assessing which belongings I want to keep, and which I will give away. Magnusson’s book provides a means and a rationale to consider my things and to decide what to do with them. She also provides advice on how to approach friends and family about what they might like. This is exactly what I need to know! The book is gently written, but no-nonsense. It is just over 100 pages long, divided into short sections with such titles as “How to Begin”. These short segments are perfect for a mindful, deliberate approach to a task that can be sobering, if not sad. Magnussen’s method emphasizes the productivity of one’s life, the special meaning of each of our belongings. However, she also makes it possible to let go of a belonging even as you value it. You might think reading my review that this is a book only for older people but, if I had read this twenty years ago, it would have helped me to be more deliberate in the things I acquired. I would have been better able to honour the belongings I had. The most important message that I received from this book was that it has not been wrong for me to collect the things that I have over the years. It is a sign that I have a full life with many people and events that I want to remember. That is so different from how most books about tidying make me feel. I will buy this book. Thank you Gail!